My nephew, who was just turning 16, was running his first half marathon in late July – the Idaho Falls Half Marathon (which was combined into the Idaho Falls M.A.D. Half Marathon). When my father-in-law told me he was going to run it, too, I had to join in the fun. The timing fit nicely into my schedule – falling between the Newport Marathon I ran on May 30 and expectations to run another marathon in early September. The Idaho Falls Half Marathon course was also a good fit for my planned September marathon. The four marathons I was considering in early September all had significant downhill portions. The Idaho Falls Half Marathon begins in the hills outside of town with an elevation drop of about 1200 feet over the first 6 miles followed by 7 flat miles to the finish. This makes for a very fast course, so I fully expected a PR going into it. I didn’t let my expectations of a PR affect my training regimen too much: The week before the Idaho Falls Half Marathon I did a quad-burning 21 mile run with 3000 feet elevation gain followed by 3000 feet elevation loss. The run itself wasn’t too bad, although I did have a nice visit with The Wall. However, the days following the long run I realized just how much I trashed my quads. I took it easy the rest of the week, but I could still feel some soreness the night before the half marathon. I still expected a PR and figured that it probably wouldn’t have a big impact over 13 miles after resting much of the week. We drove out to Idaho Falls from the Boise area on Friday afternoon and went straight to packet pickup, which was located at Bill’s Bike and Run. The Iron Cowboy and his crew happened to have stopped there as well before their final Ironman in Utah the following day. I had heard about the Iron Cowboy since an old friend’s brother was shadowing him for part of his journey. I ran into Rivers Puzey sitting in the bike shop and talked to him for a bit – he was very kind and looked just like his brother, Jacob. That brings me to an initial complaint about the race – the website didn’t have as much info as I would have liked to see. Of course, I was using the M.A.D. website, so perhaps there was another website that was better, but I wish they would have at least pointed me there. I had no idea they had combined the races until I was lined up. We ate some spaghetti Friday night and I tried not to eat too much (I love to eat). No need to carbo load in any serious way for a race that lasts less than 90 minutes. I indulged in a couple extra cookies, but nothing too serious. I got to bed pretty early, at ~9:30, so I could wake up early enough to catch the bus, which was loading at 5am. On Saturday morning we drove to the bus after I ate a bagel with some peanut butter and a PowerBar. There was plenty of parking and the buses left on time. The issue was that all the buses left at the same time and dropped off 300 runners right in front of FOUR port-a-potties. That’s right, FOUR! I couldn’t believe it. Luckily I was on the first bus so I hopped in line immediately. Also, the port-a-potties were a good quarter mile or more from the starting line. When we got to the starting line 15 minutes before race time, the crew was still setting it up. Fortunately the finished getting the timer up about 5 minutes before 6:30am, the race time, but it was pretty tacky and risky. The race ended up being delayed 10 minutes so that more people could finish using the FOUR port-a-potties. I was starting in front and talked to the guy that had won the previous year. He told me how I was actually running the Idaho Falls Half Marathon and not the Idaho Falls M.A.D. Marathon and that he won in a time of 1:17 or something the previous year. Thus my hopes at a top 3 finish were dashed. Nevertheless, I still expected a PR and a good race. There was no speech or pep talk or “thanks for coming” — just a guy off to the side who started counting down and then fired a gun (if I remember correctly). The race started at a fast pace. The downhill at the beginning was very pronounced, so no one held back. I glanced at my watch and knew I was moving fast, but I felt fine and didn’t see a reason to restrain myself and fight against the downhill. My first mile came in at 5:21, and my next three were all under 6:00. After the 6 miles of downhill, I settled into 6th place. Runners were getting pretty spread out at this point, and I was trailing an older runner by 30-50 yards. A couple runners near me slowed way down after coming out of the hill. After Mile 7 we were approaching our first turn. There was a volunteer about 200 or 300 yards before the turn who said that a turn was coming up. I don’t know why he was so far from the turn — he should have been right next to it. This was the only volunteer guiding us during the entire race, which ended up being a problem. Luckily the guy in front of me knew the course so I followed him at the first turn. I found out later that the runner in the first position missed the turn but ended up finding his way back to the course without adding any distance (it may have actually shortened it for him). There was a water station at Mile 7.5 or so, which was nice. They actually gave us miniature water bottles, which I thought was pretty strange and much more expensive (and wasteful?) than paper cups. Oh well. Shortly after the water we started hitting lots of turns. The first was a left turn. I just followed the older guy in front of me, who was gradually expanding his lead. There were spray painted arrows on the road, but they weren’t super noticeable. A block later there was a right turn and then we had to cross a road. There was no one directing traffic, so I just went for it. It was a fairly large road so I was glad I hit it without traffic. We passed three more decent sized roads, at least a couple with stop lights, and there were no volunteers to block traffic! I could hardly believe it. It was very unusual. On at least one of them I had to wait for an opening in the traffic before I could cross — that really annoyed me as I had never experienced that in a race like this. After that last big road I was getting too far behind the guy in front of me. It was becoming difficult to follow the arrows without slowing down. Luckily we were still going straight. Then we came out in a neighborhood and the difficulty increased. Eventually I was running along when I got to a stop light. I couldn’t see anyone in front or behind me. I looked for arrows but didn’t see any. I asked 3 people if they had seen any runners, but to no avail. After a minute or so of frustration, I turned around. Finally I saw some runners going towards a turn I’d missed. I was so upset! The arrow had been on the opposite side of the street that I was on and I just blew by it. My mistake cost me about 0.3-0.4 miles and at least a couple minutes! I couldn’t believe with all the turns that there were no volunteers directing runners or traffic. In my anger I ran the last mile pretty fast. I passed a few people that I had passed early in the race or hadn’t seen yet. I finished strong and felt great as I crossed the Finish, despite being upset about the missed turn. After crossing I went to grab some post-race snacks, but they weren’t set up yet. Imagine that! I briefly mingled with some of the other runners and that’s when I discovered the 1st place runner had taken a wrong turn as well. Some of my in-laws were doing the 5k, which had a later start, and a few of them also took wrong turns due to a poorly marked course and a lack of guidance. 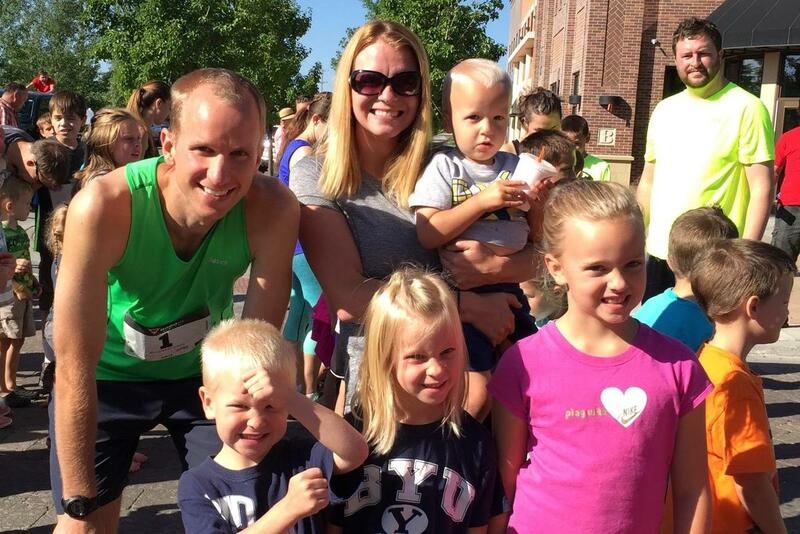 One redeeming aspect of the Idaho Falls Half Marathon was that they offered a free kids run. Three of my little ones participated and I jogged with them. It was just the right length at a little less than a mile and they all received medals. Overall I was happy with my performance, but very disappointed with the lack of organization. The course wasn’t great. I enjoyed the hills, but once in the city it wasn’t very spectacular, especially as we had to navigate traffic by ourselves. I don’t see myself doing the Idaho Falls Half Marathon again and I wouldn’t recommend it unless you have no other options.